Great unbeaten side in the Bootle JOC. I was the goalie - What happened to the rest? It was circa 1956. - But - I do remember the Everton Team of circa 1949. How about Sagar. Saunders. Dugdale. Farrel. Jones. Lello. McNamara. Fielding. Dodds. Wainwright. and Eglington. I signed for Liverpool in 1954 when they were in the Second Division and Don Welsh was manager, too. (Not bad for an Evertonian). e.j..
Hi Ron. I can name most of the team now. Maybe the names might ring some bells?? Quasimodo. Played for Liverpool in the 60's. Took the hump and transferred to Everton. First foreigner to play in the football league. I think it was subsidised by Bells Whisky at the time. That is fantastic. John Jones must be the man. I haven't seen either of them since we played together. I sincerely hope you are able to mention me to them. Great lads. Great time. Great team. Last edited by chazs001 on Fri Apr 20, 2012 8:18 am, edited 1 time in total. Arrived in New Zealand in 1964 to get away from the cold winters of the early 60's. Now residing in Pakuranga, Auckland. Hello Ernie, my name is Paul Hudson, my dad Harry used to play for St Winifred Sports and played in the cup final at Anfield (1956/7) beating Rea United 4-2 and scoring 2 goals. I've been trying to find out any information about it, I have a few press cuttings and one photo but my dad says before the final an artist came and drew a few charatures of a few of the player, my dad being one of them and I've been trying to locate it. if you could help I would be so grateful. Great to hear from someone who is interested in pre sixties stuff. I remember your dad well. Very, very talented and deserving of a place in a much higher sphere. Our team in the J.O.C.was called Winifred Sports (Not Saint) and based at the pub at the bottom of Knowsley Road near Addison Street. It was created and run by the Symes family, two of whom were in the team and, with others, poached from the very successful Salisbury team. I believe we only lost two games in three seasons. The team consisted mainly of docker's and, uniquely, although I was a 'copper', it seemed my talents created forgiveness for that. The caricatures you refer to appeared in the Liverpool Echo and have been lost in time. However, good news is that I have a copy in my old scrap book. How about that. Last edited by Ernie Jackson. (Bunty) on Tue Jan 29, 2019 11:22 am, edited 1 time in total. I remember the 'Winnie' well. We lived just over the road No15 Knowsley Road. The pub being my mum and dad's local.The Symes family were all good footballers, Bobby Symes in my class, St Joan of Arc, and a much better footballer than Roy Evans (St George's) who we played against but Bobby wasn't interested or dedicated enough to go further. OMG Ernie, you have a copy? . That's amazing. Is it at all possible you post could it on here? I have been looking for so long and my Dad would luv to see it. Another question for you. Do you know what colour the kit was and the badge design by any chance. Dad talks about Bootle U18's and a report with the headline 'Hudson bags five' i don't suppose you could give me any hints on how to find any information about that? You could search the Bootle Times archives although maybe the great genies on the site could uncover something. I can't remember answers to your other questions...I know my jersey was a green one with huge polar neck and usually full of mud. 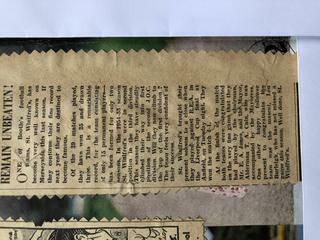 I will see if I can figure out how to post the newspaper cutting on this thread for you. Best wishes to Harry. We are probably the last two still here from that great team and it was only 63 years ago. Aww never mind, thanks for checking Ernie. Polar neck under your top . Been nice talking to you Ernie, as you say, there's not a lot of you left. I will pass on your regards to my Dad. If i do find anything i'll let you know. I have created a copy of the caricatures on another message (The Winnie 1956) in error but I am sure you will see it.